Probably that naming the coffee by country is not just for informational purposes–it’s also to distinguish the taste! The location’s soil plays a larger factor in its flavor than I had ever realized. I have too many interests to be specific. That said, it would be located in Hawaii or maybe San Diego, and include a nice balance of traveling to other countries. The job would also involve helping other people to improve their lives, who in turn can teach/help others to improve theirs. Dark chocolate. Always and any form of dark chocolate. Outside AND inside my cup. My younger self. Oh the wisdom that comes with experiencing life! I have actually pondered how these two different people would get along. And boy, would the older one have lots of advice for the younger. Ha! Now that the kiddos have flown the coop, I am finding more time for me! In the summer, I’m riding my bike or sipping wine on some outdoor cafe patio. In the winter, I’m traveling to warmer places so I can hike, bike, or sip more wine outside. Reading, cooking, and visiting a new taproom fill some time as well. How’d you find your way to Peace Coffee? I said to the universe “Hey I want to work at Peace Coffee!” I used to make myself sick going to my past jobs. Your work family is such a huge part of your life and it is important to feel good about what you do and who you work with. Pretending that some pajama pants are actually acceptable to wear to run errands in the winter. 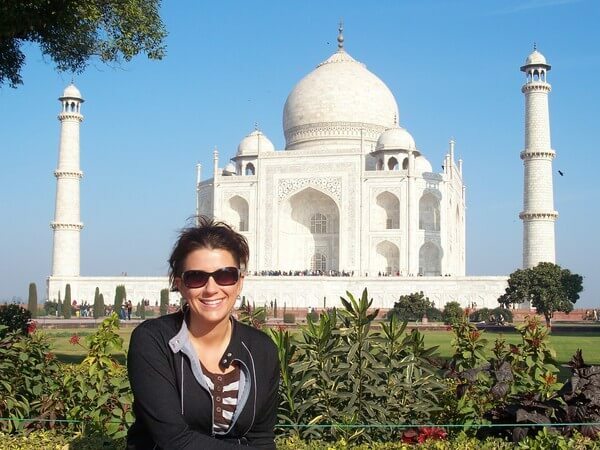 I’d love to revisit India! I met my husband on a plane to India while participating in a study-abroad during grad school, so I have an extra fondness for the country. I love the people, the FOOD, and especially the energy I felt while visiting a few of India’s growing organizations. How does one illustrate sarcasm? In the most jovial way, of course! It’s a tie! One is when I finished my first sprint triathlon. What a rush for a (mostly) non-athlete! The second was the morning bike ride I had with several of my closest friends a couple weeks before my wedding. You know you have amazing friends when they are happy to choose a morning bike ride over a night on the town for a bachelorette party!